We're specialists so offer only the best advice and back-up service than fishing tackle shops! 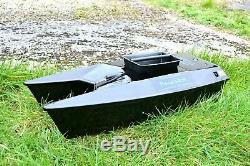 In production now from Angling Technics since the late 90ies these really are very popular small and compact boats and weighing in less than 3 kilos including with the battery you'll hardly know your carrying her! Taking inspiration from the stability of the twin hull catamaran design, the Procat MKIII offers outstanding stability even in rough water conditions. 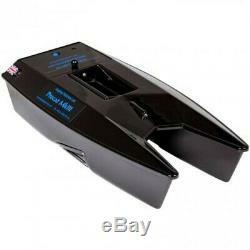 This ensures that youll always be able to use this bait boat with confidence, no matter the weather conditions. Similar to the Microcat MKII in many ways, there are a number of subtle differences to the Procat MKIII which really set it apart from other bait boats on the market today. Firstly, it is fitted with a single. Hopper in the hull, which, with a capacity of 0.75kg, provides ample bait space for a single rod baiting session. This is a boat which has been designed with short session and roving angling in mind, rather than triple rod carp fishing. 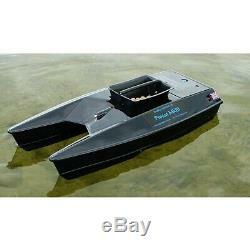 However, if youre prepared to head out and back with your boat a number of times, this bait boat can serve admirably in all scenarios especially considering its size. This boat has a 90 minute run time from a single charge, which is ideal for most day session needs. You might be surprised that the boat can offer this impressive run time, especially considering it weighs in at a mere 2.75kg (with the weight of the battery included). This is because the Procat MKIII is powered with a propeller based system rather than a jet propulsion, ensuring the less energy is required for the boat to travel the same distance. This represents a significant increase from the running times of both the Microcat and the original Angling Technics Baitboat, too. 2.4 Ghz radio system - microprocessor enhanced. Light - 2.75kg including battery. Efficient - 1½ hours running time. Remote lighting control - Light brightness controllable from the transmitter (left hand joystick). Directional control - all on the right hand joystick. Low profile - only 135mm high. Robust - high strength acrylic capped ABS. Reliable - zero maintenance drives. Quiet - low noise hybrid drives with no servos. Maneuverable - twin reversible drives. Stable - CAD designed catamaran hull. Intelligent - advanced battery gauge built in. Bait capacity - 0.75kg. Size: 620mm x 280mm x 135mm. Single hopper (1 kilo capacity). 62cm x 28cm x 13.5cm makes this Angling Technics Procat MK3 is the optimum baiting machine for the angler who likes to travel light whilst still having all the latest in angling technology. 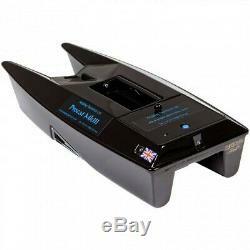 Procat MKIII Bait Boat + remote. Operational DVD and manual all ready to go.. 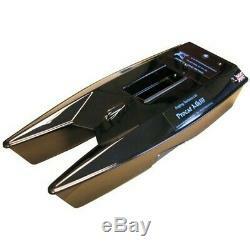 The item "Brand new Angling Technics Procat MK3 Bait Boat + Spare Battery" is in sale since Thursday, November 28, 2013.